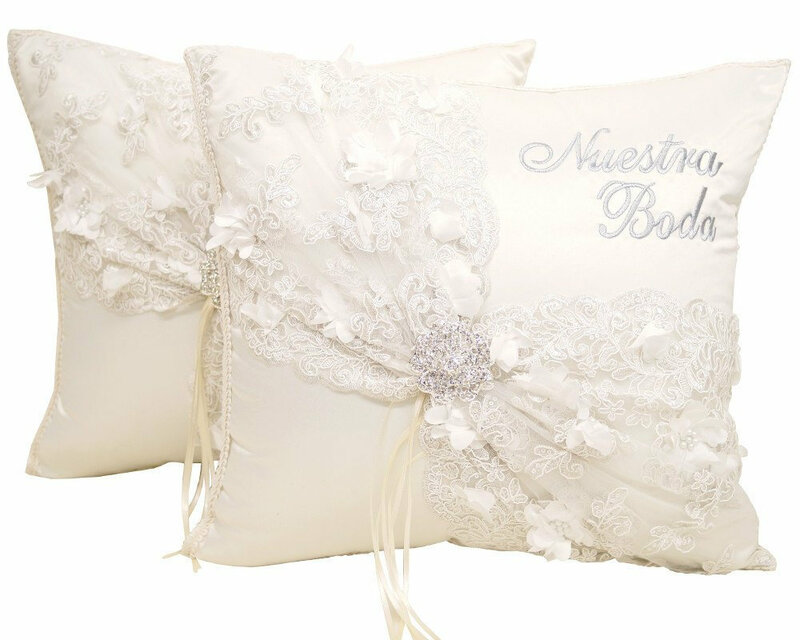 The bride and groom wedding kneeling pillow set measures 15” x 17” and comes in a set of 2 pillows. Handmade from soft ivory satin fabric, these elegant satin kneeling pillows feature beautiful silver “Nuestra Boda” embroidery, a large sparkling brooch and romantic lace paired silk flower accents. We recommend ordering at least 2-3 weeks before the wedding date. Thank you for understanding that we do not offer customization. Let us know if you have any questions! The product it self is described as "hand made" but it was "made in China". Maybe I was just expecting this to be"hand made" and not on a mass production scale. Some of the beads fell off during shipping and it truly isn't what I was expecting. Looks great! Can't wait to give it to my niece to wear as flower girl at my wedding! She can reuse it at her first communion next year. Beautiful, matches my daughter’s communion dress perfectly! When possible, we do our best to ship within 1-3 business days and custom items within 3-5 days. Orders received on the weekend are processed on Monday. Kindly view the shipping estimates below. Please see our announcements and the individual items for current shipping time frames. We kindly decline customization requests. Please be aware that requests for customization may delay shipment. For expedited shipping, kindly select expedited USPS Priority Mail at checkout. Thank you for understanding actual delivery will depend on the US Post Office. Please allow sufficient time for delivery. We are not responsible for orders returned because of an incorrect address. If packages are returned because of an incorrect address, we will gladly refund your order. Shipping costs are not refundable. Please feel free to message us and we will do our best to reply within 24 hours. For messages received on the weekend, please allow us extra time to reply. We want our customers to be completely happy with their order. If you have any questions or concerns, reach out to us and we will be happy to work with you.